When winter wraps its icy fingers around Madison, Badgers need a place to burrow — and have fun. Deep inside Union South, they lace up their bowling shoes and hope for strikes (or at least spares). 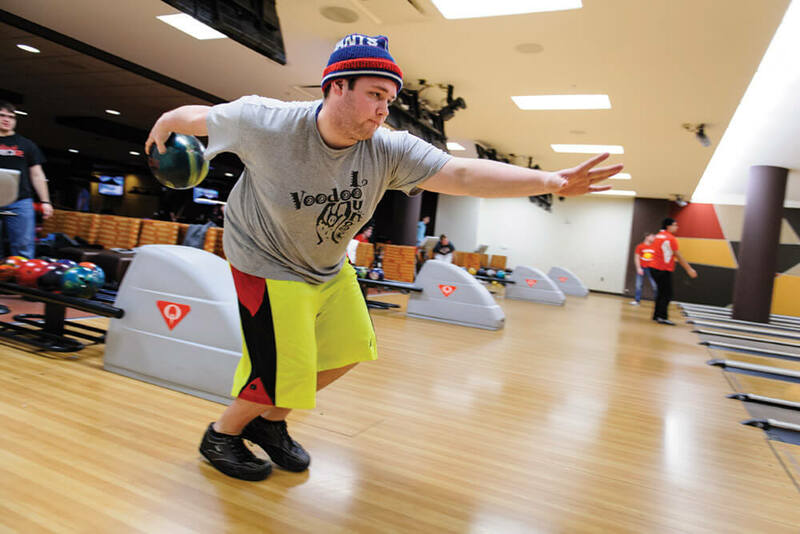 In a recent one-year period, bowlers of all abilities played 58,520 games on the building’s gleaming lanes. Wisconsin is what you could safely call a bowling state. High schools have teams, which is where many Badgers sharpen their skills before coming to Madison. And the UW has a team. Representing one of thirteen schools that make up the Wisconsin Collegiate Bowling Conference, it takes over the student union’s eight lanes to practice on Monday nights. Even with frigid temperatures outside, some wear shorts with their bowling shoes. There is high-fiving and trash-talking. Distinct bowling styles are on display. A few team members stick out their weak side legs, flamingo-like, as they release their balls, bending their knees back behind them. For some bowlers, the ball makes a guttural thud as it hits the lane. For others, it just barely kisses the surface before smoothly rolling toward the ten pins and knocking them down with a crash. There used to be other places to bowl on campus. In 1910, four lanes opened in Lathrop Hall, designed to give female students some space to engage in physical activity. The lanes remained until the building underwent a major restoration in the 1990s. Memorial Union added six bowling lanes during a 1939 remodeling project, but those were closed in 1970. The old Union South opened that same year with eight lanes — enough to accommodate the bowling team. In many ways, bowling is a throwback, a connection to an era when people gathered without the distractions of cell phones and text messages. It brings back fond memories for those who perched on barstools and munched on french fries during their parents’ Friday night leagues. Whether a final score is 200 or somewhere south of 80, it’s fun. And the best part? It’s cheap. You can rent shoes and bowl a couple of games on a Saturday night for about $10.